To help students develop a keyword, identify the new term and give the students its definition. Find a keyword that relates to the new term using a visual image or a familiar phrase. If possible, show the students a picture that makes as association between the keyword and the new word. This will help cement the definition of the new word in their minds. For example, when learning the word “rain day,” a specific term for a family of frogs, a good keyword would be “rain.” You could show students a picture of frogs dancing in the rain to help them remember. There are a variety of mnemonic techniques, including keywords, peg words, acronyms, acrostics, loci methods, spelling mnemonics, phonetic mnemonics, number-sound mnemonics, and Japanese “Yodai” methods. The keyword method Levin in McWhorter, (1992:141) is a mnemonic method at helps students to learn new information by associating it to interactive visual images for later recall. The effectiveness of the keyword method is also based upon adherence to there assumptions about picture strategies for learning. First, pictures or images can facilitate learning because provide a means by which to learn difficult material. Second, the more directly the pictures or images are to the content to be learned, the more effective the learning will be. Finally, even given the previous two assumptions, research suggests that the pictures will not be helpful if they are not familiar enough to provide an organization frame work for understanding and retrieving the new information. 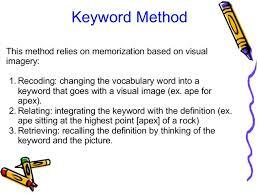 The keyword strategy meets that this assumption and the two aforementioned assumptions by enabling students to the recode the new material to be learned into a concrete keyword and relate it within a visual image so it can be easily retrieved. The keyword method was originally used to improve college students’ ability to learn a foreign language Atkinson in McWhorter, (1992:143). Since then, the use of method has expanded to help students, elementary through college, to learn vocabulary and content facts. Using the passage, the teacher must decide what particular minerals are to be learned and where ach of them is used. Next, a keyword must be assigned to each mineral. Then, the visual image of the keyword interacting with its primary use is developed. It is recommended that an actual illustration be used to demonstrate this image; however, an elaborate statement may be used it can easily create a mental image for the students. Tell students that key will be using a study method to help them remember the names of minerals they need to learn and their use. To demonstration the keyword method, use the example of amber. Provide a short description o it and tell them it is used primarily in the home. Exampling to them that a keyword, which either looks or sounds like amber, will help them learn the information they need to know. Since hamburger sounds like the target word, it be comes the keyword for that mineral. Next, students are shown a picture of a hamburger sitting on a chair in a living room. They are informed that by thinking of the picture they will remember that amber (hamburger) is a mineral used primarily in the home (living room). Other demonstrative example should follow until students’ understand the concept of the method. Distribute to the students a short passage about the first the target mineral, rhodonite, which is used in the home, and a illustration showing a road going through a living room. The target word, rhodonite and the keyword, road, should be used as captions for the illustration. The students are directed to read the passage and examine the accompanying picture for the purpose of recalling the mineral and its use. The picture should be discussed as to how it helps them recall the information. Break students into small groups of there or four members and have them read the rest of the rest of the text information about minerals. Provide them with keywords and have them develop their own mnemonics images, given the examples you previously prepared. These should be shared with the whole class. To initiate the successful transfer of this method from teacher provided keywords and illustrations to student-oriented mnemonics, provide additional text information about minerals without supplying a keyword. Students will then need to read the material and develop their own mnemonics to aid in the recall of the material. They will need to be reminded of the study technique and how effective they may have found it. Students will also need encouragement and feedback as they develop their own visual images. Again, these should be shared with the whole class for purposes of feedback. To further promote transfer, watch for other opportunities for students to use the keyword method in their other subject matter areas. They may need to be prompted by the teacher or other students until the method is fully learned. The method will be considered using an example adapted from Konopak and Williams (1988, 685-687). It involves a fifth grade science unit on minerals in which students are asked to recall the names and primary use of various minerals. Belum ada tanggapan untuk "KEYWORD METHOD IN READING"